Dubai, UAE, December 20, 2017: Skyline University College has signed a memorandum of understanding (MoU) with Jaipuria Institute Management on December 11, 2017 in Noida, India. 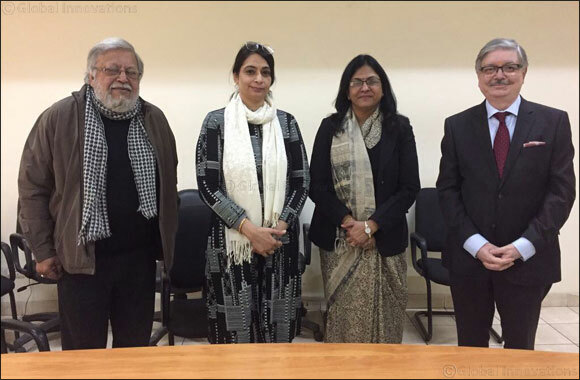 SUC Dean Dr. Amitabh Upadhya and Jaipuria Institute Management Vice-Chairman Mr. Shreeva Jaipuria signed the MoU on behalf of their respective organizations. Both parties have agreed to collaborate on several areas of cooperation such as Faculty Exchanges, Student Exchange, Collaborative Projects, Scholarships, Information Exchange, Conferences, and Program Reviews. Also present during the signing ceremony were Jaipuria Institute Management Dean of International Relations Dr. Poonam Sharma. The MoU was successfully coordinated by SUC Corporate Affairs Office headed by Mr. Pawan Bhatia.